More than 100 aircraft are expected at Thumamah Airport, Riyadh, for the inaugural Saudi International Airshow, making air traffic control critically important. The event, a first of its kind for Saudi Arabia, aims to further connect the aviation and aerospace industries to Saudi Arabia. SANS, which began operation in July 2016, is responsible for monitoring Saudi Arabia’s airspace and for ensuring its safety and security at all times. SANS is responsible for managing aircraft movements that utilize the Kingdom’s airspace and/or its airports, employing cutting-edge navigation systems and equipment operated by highly qualified personnel on a 24/7 basis. With the large number of private, business and commercial aircraft expected for the Saudi Airshow, SANS will play an important role in managing arrivals, departures and aircraft movements during the event. 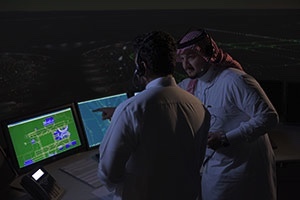 Saudi Air Navigation Services (SANS) is responsible for providing air navigation services in the Kingdom of Saudi Arabia, where the company plays an important and vital role in the security and safety of airspace and aircraft movement within Saudi airspace.